*You can add potato with skin too, it gives a good taste. But make sure wash potato well. I have peeled it coz my son does not like them with skin. Pressure cook all of the above with a pinch of turmeric & 1tsp of slat for 4 whistles. 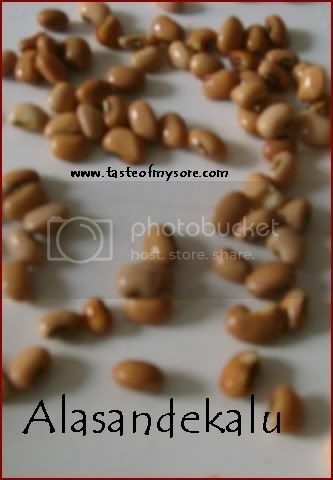 A picture of Alasandekaalu/black eyed peas for you all.. Grind everything to make a smooth paste with little water. Clean and cut dantina soppu/amaranth leaves finely. Heat oil in a wide pan. add mustard seeds once it stops crackling add uddinabele, let it turn brown. Throw chillies, onions stir and mix. Add salt. Next goes chopped greens. Mix everything well and cover the lid and cook till leaves wilt and stems are cooked. 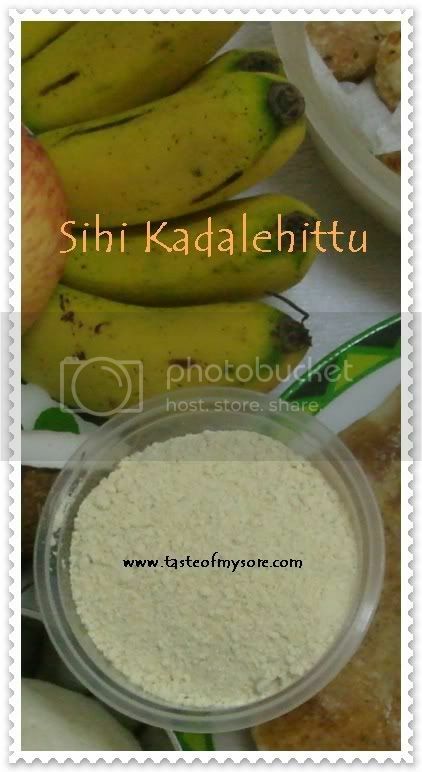 Switch off the stove garnish with grated coconut and serve hot with chapathi/Roti . Take note this vegetables requires very less oil about 1tsp, reduce the amount of coconut used and a healthy veggie is ready to go with chapati. Ganesh Chaturthi festival brings home lots of Sweet Kadalehittu or you can say Sweet gun powder :D. Every temple, almost every house packs them and keep it ready to give it to their guests. This has been a tradition for looooong time in Mysore, Bangalore regions. Take 1 cup of the above powder, mix luke warm milk (1tbsp), warm ghee, and mix it to make a laddu! a quick dessert is ready to eat. Wanna make it more delicious?? add more ghee and grated wet coconut and it is a treat :) Enjoy Madi !! So mouth-watering platter! Everything looks delicious, especially black eyed peas. 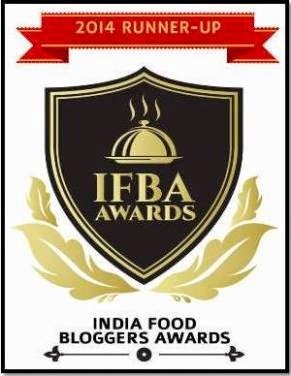 first of all , the thali looks wonderful, and the recipe for black eyed beans is something worth trying..amaranth stir fry looks good..overall a healthy meal..v.good post LG. Alasnande kaal hili looks yummy.. I just started feeling hungery!! I wish i could eat everything on the Thali!! That is beautiful conforting meal Laks! I wish u a Happy festival! all the recipes are so good! Hey, Thanks for the recipes. 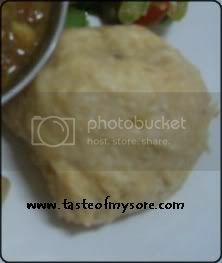 Just started to cook n had hard time finding Karnataka recipes which amma used to prepare, your blog helped me a lot!!! 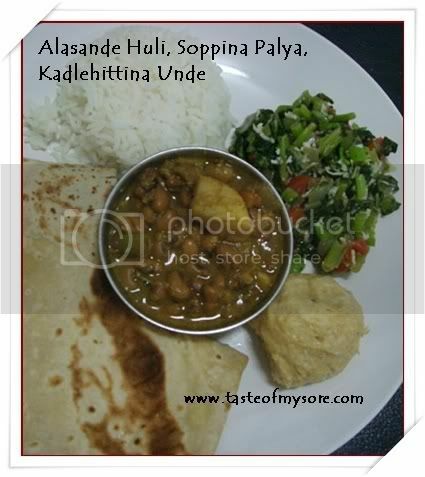 Last night I tried the Soppina Palya recipe you posted here. The simplicity of the recipe and the back-to-basics goodness of the palya blew me away. I typically overcook, over spice and over-everything when it comes to greens...this was just fabulous! Thank you!! !Even my 11 year old gobbled it up and for that you deserve a pat on the back!